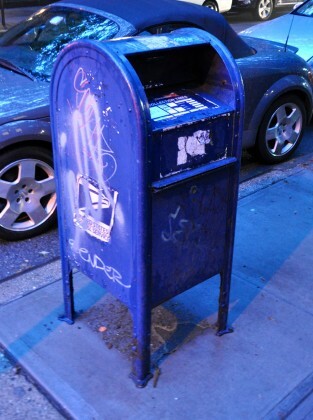 A USPS mailbox at the corner of Columbia Heights and Pierrepont Street has revealed a brazen new blue hue… without any particular rhyme or reason. We conducted a web search to see if the struggling U.S. Postal Service had perhaps purchased millions of gallons of the gaudy blue paint at a marked discount… but nuttin’. During a casual walk around the neighborhood Tuesday eve, it appears this is an isolated incident, so far. In any case, it sure looks better than the graffiti-filled USPS box at the corner of Hicks and Pierrepont… and so it is. It’s part of the new Citi Box program. 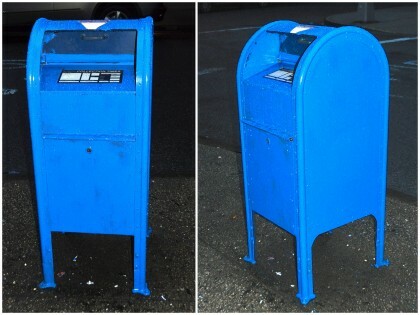 City bank bought the failing USPS, who installed the boxes at random locations locations throughout the country, without any thought or community input. It’s the work of Captain Cleanup! That brave vigilante who wages a never ending war against graffiti! It’s against the law to tamper with a USPS mailbox, even if it is an improvement. The mailbox at Joralemon and Willow Place looks like crap. Too bad some of the wealthy homeowners there don’t take the lead and get it cleaned up. When the law is unjust, then the just will become outlaws. Captain Cleanup! we always repaint the mailbox and mailbox dropoff in front of our building. have been doing it for years. otherwise they would look awful with all kinds of graffiti. After repainting several times, the graffiti stops. We tried to match the regulation colors though. I’m not sure about this electric blue. FYI, doing that is a federal crime. Be careful what you wish for… with the current budget issues, they might not be able to replace and just take that one away! Make sense… no, so that is what the PO would do. You can thank the Montague St. BID for the painting of the light poles, hydrants, etc. on Montague St. this week. They also regularly remove graffiti from the trash cans and other street furniture on Montague St. I once Googled “olive drab” which led to “khaki”—a great Wikipedia article. From those nice people who gave us the words “assassin” and “bungalow”. Late to this thread but I love your reply Mr. X.
I’d like to hear the results of your color experimentation; for example, how to color-match the antique fire alarm boxes.